Intricate wisps of glowing gas float amid a myriad of stars in this image created by combining data from NASA's Hubble Space Telescope and Chandra X-ray Observatory. The gas is a supernova remnant, cataloged as N132D, ejected from the explosion of a massive star that occurred some 3,000 years ago. 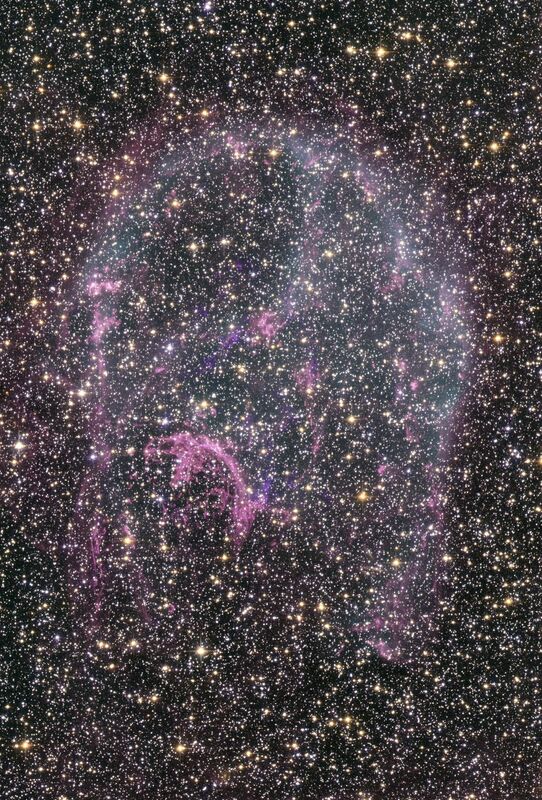 This titanic explosion took place in the Large Magellanic Cloud, a nearby neighbor galaxy of our own Milky Way. The complex structure of N132D is due to the expanding supersonic shock wave from the explosion impacting the interstellar gas of the LMC. Deep within the remnant, the Hubble visible light image reveals a crescent-shaped cloud of pink emission from hydrogen gas, and soft purple wisps that correspond to regions of glowing oxygen emission. A dense background of colorful stars in the LMC is also shown in the Hubble image. A supernova remnant like N132D provides a rare opportunity for direct observation of stellar material, because it is made of gas that was recently hidden deep inside a star. 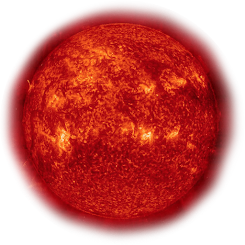 Thus it provides information on stellar evolution and the creation of chemical elements such as oxygen through nuclear reactions in their cores. Such observations also help reveal how the interstellar medium (the gas that occupies the vast spaces between the stars) is enriched with chemical elements because of supernova explosions. Later on, these elements are incorporated into new generations of stars and their accompanying planets. Visible only from Earth's southern hemisphere, the LMC is an irregular galaxy lying about 160,000 light-years from the Milky Way. The supernova remnant appears to be about 3,000 years old, but since its light took 160,000 years to reach us, the explosion actually occurred some 163,000 years ago.